To protect yourself and your computer, the best option is to delete the file. 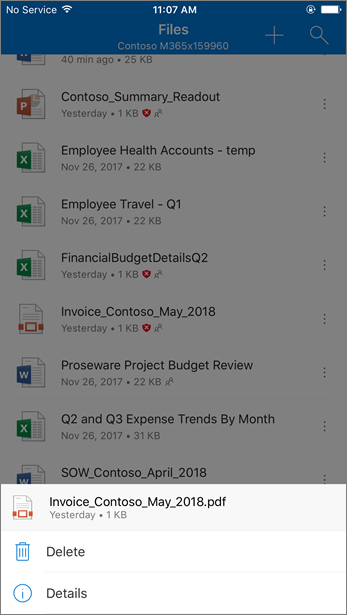 From the OneDrive mobile app, your only option is to delete the file. Select the file you want to delete (on the mobile app, press and hold to select it). Why is a file in OneDrive blocked? The file is blocked to help protect you and your computer from malware. Although it can be inconvenient for a file to be blocked, getting infected with malware is even worse. Cybercriminals use ransomware, technical support scams, or unwanted software to compromise users and computers. Once cybercriminals get access to user credentials or sensitive information, they can use that information to gain access to more information or other users, or even charge fraudulent fees. To learn more, see Understand the different malware types. What can I do to avoid running into malicious files in the future? Although cybercriminals continue to find new ways to trick people with malware, there are steps you can take to help protect you and your computer. Run security software on your computer and keep that software up to date. See Help protect my computer with Windows Defender. Install the latest software updates on all your devices. See Windows Update: FAQ. Use caution with email attachments and files. See How to recognize phishing email messages, links, or phone calls. To learn more about how malware works and how to prevent malware infection, see Help prevent malware infection on your PC.